Directors are hoping to have the film ready for summer 2014. Arnold Schwarzenegger, pictured here at the premiere for "The Expendables 2" in Los Angeles, is set to star in "The Legend of Conan." There's a familiar Barbarian at the gate. Arnold Schwarzenegger is set to star in "The Legend of Conan," an extension of the Universal Pictures franchise that kicked off in 1982 with Conan the Barbarian, the studio confirmed Thursday to E! News. 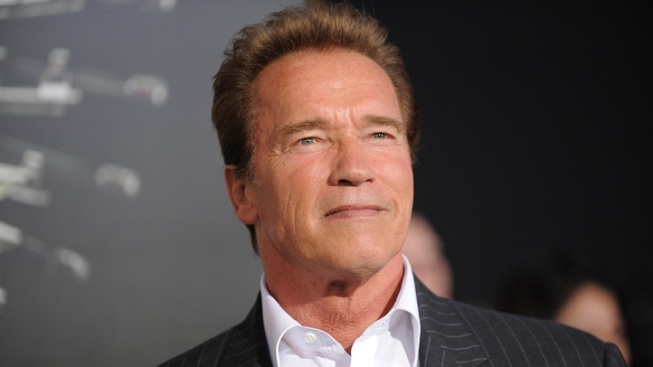 And yes, Schwarzenegger will play the titular warrior again, picking up "where Arnold is now in his life," according to Chris Morgan, who is coproducing with Paradox Entertainment's Fredrik Malmberg. Will Arnold's former mistress see his movie? She read his book! "I always loved the Conan character and I'm honored to be asked to step into the role once again," Schwarzenegger told Deadline, which first reported the news. "I can't wait to work with Universal and the great team of Fredrik Malmberg and Chris Morgan to develop the next step of this truly epic story." Universal, which put out the first Conan flick and its 1984 sequel, Conan the Destroyer, did not have a hand in last year's bomb of a remake of Conan the Barbarian, starring Game of Thrones' rather hunky Jason Momoa as the sword-wielding, loincloth-wearing hero. But with Arnold on board, they sound excited to get back into the game and are hoping to have the film ready for summer 2014. "I love the property of Conan so much that I wouldn't touch it unless we came up with something worthy," Morgan told Deadline. "We think this is a worthy successor to the original film. Think of this as Conan's Unforgiven." In fact, "The Legend of Conan" will proceed as if neither the reboot nor the Destroyer sequel ever happened. "By the end of [Conan of the Barbarian]," Morgan said, "Conan became a certain character, and this film picks him up there, as he faces different challenges that include dealing with age." Conan isn't alone--look at all the movies that have been remade over the years!